AN ABATTOIR in Coominya will be producing its base load of power onsite through state-of-the-art technologies within six months. Greenmountain Food Processing will install six steam turbines to generate the electricity. The project is being supported with a dollar-for-dollar commitment by the Federal Government. Greenmountain director John Scarrabelotti said the technology would help keep the company in the area. "We need to make these savings to stay in business," he said. "Our information tells us the price of electricity is going to keep on increasing, so we needed to act sooner rather than later." Mr Scarrabelotti said while the project would cost close to $1million the long-term savings would greatly benefit the company. "Our costs are only going to go up. We needed to do something about that. We need to make the savings stay in the business." Mr Scarrabelotti said the company had been researching the project for two years and was expecting it to be complete by April next year. The project is expected to cut the company's costs by up to 34%. The turbines will generate 300 kilowatts using steam the abattoir already generates for rendering. Greenmountain exports meat across the world with products going to the EU, China, Canada, Taiwan, South Africa and the United States. 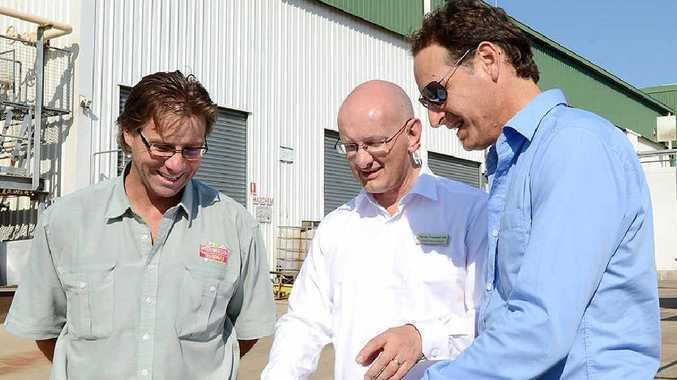 Federal member for Blair Shayne Neumann said the government funding has been provided through the Clean Technology fund. "This is a great project for the Somerset region," he said. "These guys employ 230 people and this keeps those jobs secure into the future. "This is a project that will have a 19% reduction, at a minimum, in their carbon emissions. And in an industry that's traditionally been a high-emitting industry, this is a real success story." Mr Neumann said the project was an example of the Federal Government and the carbon tax working to reduce emissions. The government will contribute $498,750, half of the cost of the project, through the Clean Technology Investment Project. "It's a win for business, the economy and the environment," he said.